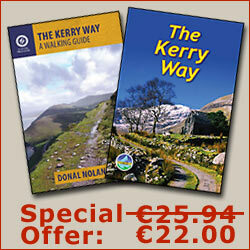 This stage of the Kerry Way starts from outside the Kenmare Tourist Office (only open in Summer). The first two-thirds of the section is uphill climb to the Windy Gap at around 320m. Leaving Kenmare, the Kerry Way spends the first 1km reaching the edge of the town. Passing Holy Cross Church, several bed and breakfasts and a newly-built supermarket, the trail finally arrives at the solitude of the country. From here, the road starts to steepen as it briskly climbs 170m over 2km to reach a saddle between two small summits of Strickeen and Inchimore. Briefly dropping 60m, it once again rises to meet Gowlane after 1km. Joining an old coach road at Gowlane, the trail continues to climb a further 140m over next 2km leading to a gap between Peakeen Mountain and Knockanaguish. Stopping to look back to the south, there are views across Kenmare Bay to the Beara Peninsula but the sight of Kenmare itself is blocked by Strickeen Hill. 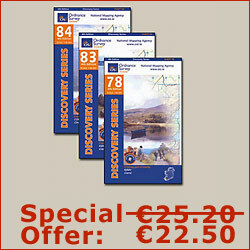 The Kerry Way descends 220m over the next 4km, once again returning to Killarney National Park. Incheens is surrounded by a splendid horse-shoe of mountain peaks. From Eagles Nest to the west, to Peakeen and Knockanaguish to the south. 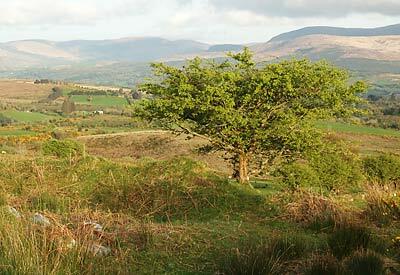 Knockrower and Shaking Rock are to the east and Stumpacommeen and Cromaglan Mountain to the north-east. The exit to the valley is to the north with the more distant Purple Mountain on the horizon, above Killarney's Upper Lake. After walking 3½km from Windy Gap, the Kerry Way once again splits into two with Galway's Bridge straight ahead and the route to Killarney climbing up towards Cromaglan Mountain. Alternatively, there is space to leave a car in advance at Galway's Bridge and finish the walk here.